SEAN WORRALL is an artist and (sometimes reluctant) curator, currently based in East London. Sean Worrall’s current body of work is very much related to where he currently lives and works, his current body of work explores the notion of new layers growing over old, the reclaiming of those things that are left to decay, the idea that our cities will eventually be covered and lost in new layers of leaf growth. Lost in the short term as we use the city walls as a street art canvas, then as nature paints her own leaf shaped beauty over the top of it all and takes everything back, The ideas of Trillion Green, the Captain’s Table Sean’s paintings explore the taking back of old walls, the growing over, the freshness of new leaves, new marks, old surfaces, always growing. Newly weathered marks over old faded shapes, new layers, fresh leaves. Sean believes strongly that art should be about community, that it should exist within community, that doors should be open, that an art gallery in nothing without the people who come in. Sean Worrall is currently engrossed in the act of surviving as a full time artist (and reluctant curator), currently defiantly based in a concrete bunker in East London. Sean’s background is in punk rock, street art and the photocopied DIY zine-driven underculture of the last century – that and his delicately flowery textile design work approached in a contemporary painterly kind of way. Sean spent the late 80’s and the early 90’s promoting DIY music shows, running zines, a busy underground record label and drawing delicate leaves and flowers while studying textile design and leaving his art on the street, or up against walls or spray painted on walls (long before social media and everyone sharing everything on line instantly), Sean spent the 90’s immersed in underground zine culture, alternative music and the running the highly successful Organ magazine (a publication that grew from a handmade hand-printed photocopied DIY zine to a cutting-edge glossy alternative music and arts publication with a worldwide reputation and readership). Sean ran a very busy underground record label, put on hundreds of music and art events in conventional venues, unconventional venues, Camden pubs, squats and alternative spaces all over London, he painted and created records sleeves and more for several bands and labels, ran a weekly TV show (long before the internet kicked in properly), toured the UK and Europe as the “in-house” artist with a band – creating their art, creating art at their gigs, as well as writing for several music publications.. The start of this century was all about record labels and releasing a number of significant cutting edge band-launching records via Sean’s then growing record label, as well as regular radio shows, glossy magazines, tours, gig promotions and things getting far too big. Something had to give, Sean dropped the record label, the magazine, the music, the Organ and everything else to focus on nothing but his need to paint.. Since 2009 Sean has been devoted to nothing but painting (and curating). Painting on canvas, painting on on things that are left on the street, more painting on the actual street, on walls, on doors, street drops and the rest,.as well as exhibiting his more conventional canvas work extensively around London and beyond in solo shows and group shows at various gallery and events. Sean (and co conspirator Emma Harvey) spent four years running a very busy always open maximalist (punk-rock flavoured) art gallery right in the middle of Vyner Street, East London, Cultivate opened in late 2011 following on from the very successful Stinging Netil take over of an East London market for a summer’s Sunday full of art, performance and music, 48 artists and a day of live performers, painters and bands. The one day event was curated by Sean and fellow painter Emma, and that good feeling left by the Stinging Netil was to be the catalyst the for Cultivate. A gallery space opened right in the middle of what was then the central focus in terms of East London art, Vyner Street was then an almost unique street alive art galleries and studios and more, we almost defiantly opened the door to Cultivate smack bang in the middle of it all (the always open door was a very important part of it, no unwelcoming closed doors and aloof buzzers for us, rain or shine, the gallery door was always open to everyone). Cultivate in Vyner Street saw massive crowds, some 112 shows and events before is all came crashing to an end at the start of 2015 as the developers moved in and down came all the walls of all the galleries. Cultivate goes on though, we’re rather enjoying the current nomadic lifestyle as we continue to curate in various galleries and spaces under the Cultivate banner..
2014 was mostly taken up by all the time-consuming work of creating and showing work of his own as well as the art of many others at nomadic Cultivate events. Sean also spent time post Vyner Street creating several new Hundred Pieced Pieces (pieces of art in one hundred parts – one hundred pieces of cardboard sold for £1 each, one pieces of 12″ phand painted vinyl and such – as well as taking part in events and shows such as A Fate Worse Than Death and celebrating the life and times Johua Compston via a the idea of A Better Woolworths, traveling with the Art Car Boot Fair, taking part in the Folkestone Fringe (at 2014 year’s Triennial), the Liverpool Biennial, enjoying being part of shows in car parks in Westminster, Soho, Hoxton and Brick Lane, in high-profile artist-led group shows like the excellent We Could Not Agree (widely acknowledge as the best thing to happen during Frieze week that year), the Chinese Open, that year’s Off The Wall show, The Big Deal show in a warehouse over in Fulham, the Brick Lane Art Car Boot Fair itself (Sean has been invited to take part in the prestigious event for the last six years running now), the Sunless show in Bermondsey, the Hackney Wick Take Back, the Hackney WickEd weekend (where Sean painted one hundred paintings on found things – doors, skateboard decks, found canvas and such and left them all on the Hackney Wick streets to be taken by people during the WickEd weekend), as well as taking part in numerous other shows, street events, art drops and such in and around London. In 2015 Sean embarked on the #365ArtDrops project, a series of 365 paintings on things found on the street, things recycled – old paintings saved from skips, planks of wood and such, all worked on and treated as blank canvases – worked on, recycled and them put back on the street for people to take. The #365ArtDrop pieces were mostly hung on walls in East London, the pieces re-emerged in collections and hanging on people’s walls all over the globe with finders using the hashtag to post about their found art drops via the various stands of social media. 2015 also saw Sean and a fellow painter Emma once again collaborating to take over a massive (condemned) East London warehouse to curate an ambitiously large group show alive with contemporary painters, installation, street artists, performance, sculpture and more. The weekend warehouse show was called Play, and as gentrification saw more spaces and galleries go under the wrecking ball some said Play was East London’s last stand in terms of big artist-led DIY art events – the mood was certainly changing in the playground that was once the east of the city, the fallen down art spaces replaces by fancy coffee shops and an endless parade of establishments imposed on a community it was driving out. .
2016 saw several #43 piece solo shows in London galleries (shows of 43 paintings all sold at £43) as well as short-notice pop-up afternoon shows under railway bridges, shows in draper shops as well as solo shows and group shows in more formal gallery spaces as the Sometimes They Have Thorns series of paintings continued to be explored and the leaf motif (or tag) repeated in a street flavoured pop art manner. 2016 saw more Cultivate group shows in railway arches, basement galleries as well more adventures and seaside treats in Margate, Hastings and such, the Debased and Debaser Cultivate group shows in a Dalston basement gallery over on London N16 were particularly highlights of another busy year. Aug 2018 – 43 pieces of the on-going #365ArtDrop18 at the BYLINE FESTIVAL, Ashdown Forest, Pippingford Park, Uckfield, Sussex. Sept 2017 – #43 – A piece of work in 43 parts. 43 paintings hung out on the streets of Folkestone. 43 paintings for people to take should they wish to. 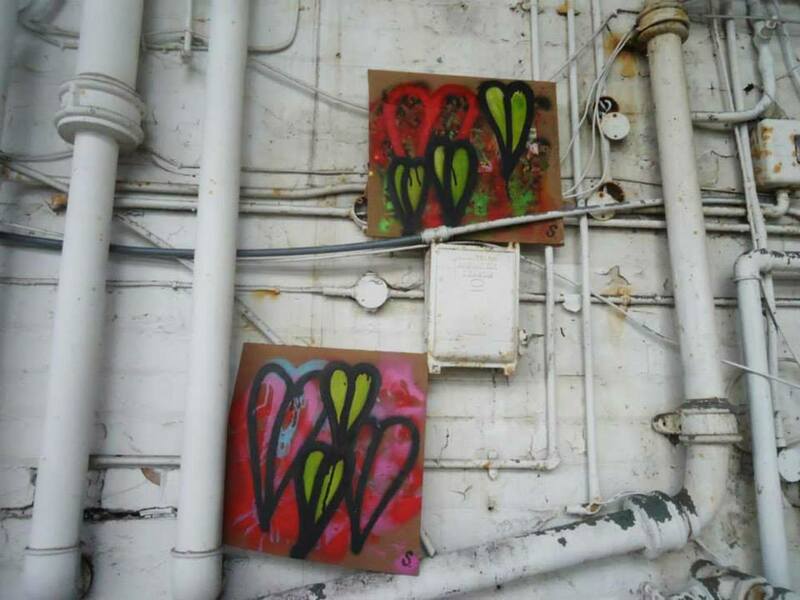 July 2016: #43 – A Hackney WickED Art Drop, 43 paintings hung out over the the weekend of July 30th/31st During Hackney WickEd at Hackney Wick, East London. June 2016: HARVEY & WORRALL at WALL & JONES, a collection of paintings around the treasure of Wall & Jones, an Edwardian tailor’s shop, Hackney, East London. April 2016: SOMETIMES THEY HAVE THORNS – Fount Gallery , Hackney, London. Feb 2016: #43 a new piece of work from Sean Worrall consisting of 43 pieces and revealed somewhere in London on Friday February 12th, the 43rd day of 2016. Jan – Dec 2015: #365ARTDROPS – A piece of work in 365 parts, 365 paintings on things found on the street, put back out on the streets for people to take. Aug 2014: The FIFTH ONE HUNDRED PIECED PIECE at the Hackney WickED arts festival, East London. June 2014: THE ONE HUNDRED PIECED VINYL PIECE – June First Thursday at Cultivate,Vyner Street – A wall full of painted vinyl and a first taste of the One Hundred pieced Vinyl Piece created for the 2014 Art Car Boot Fair. Jan 2012: PRUNING SHOCK, Works by Alan Wilson and Sean Worrall at Cultivate, Vyner St.
Sept 2010: LEAVES, FRIENDS, SHAPES, ADVENTURES IN KENSAL GREEN, Dissenters Chapel Gallery, Kensal Green Cemetery, London W10. July 2010: A drop of 23 paintings around West London somewhere sometime during West London First Wednesday – under the Westway, Portobello Road, who knows where…. Dec 2018 – END OF THE LINE FESTIVE FAIR – End of The Line Gallery, Shoreditch, East London. Jan 2018 – INTENT (Part Two) – Cultivate at BSMT Space, Dalston, London. July 2016: ON THE BRINK – A 3D Exhibition – An event in the grounds of The Wanstead Quaker Meeting House, London, E11 as part of the Walthamstow Art Trail. April 2016: THE CULTIVATE SPRING ART MART at Fount Gallery, Hackney, London, E8. Nov 2015: DEADCUTS at the Ritter-Zamet gallery, Whitechapel, East London. Aug 2015: ART CAR BOOT FAIR at the Turner Contemporary, Margate. June 2015: PLAY – A group show In a beautiful big empty shell of an East London warehouse, Hackney, London, E8, curated by Sean Worrall and Emma Harvey. Sept 2014: I’LL BE BACK IN FIVE MINUTES. The last group show at Cultivate, Vyner St.
Sept 2014: WE ARE THREE, a third birthday group show at Cultivate, Vyner Street. Aug 2014: OFF THE WALL – The 9th Terrace Annual Open, Terrace Gallery, London E8. April 2014: APRIL FIRST SATURDAY – The second Vyner Street First Saturday, an all day event at several Vyner Street art spaces, London E2. March 2014: MARCH FIRST SATURDAY – The first Vyner Street First Saturday, an all day event at several Vyner Street art spaces, London E2. DEC 2012: DREAMING OF A BLACK AND WHITE CHRISTMAS, A Side B Side, Hackney. Sept 2012: FREE ART FRIDAY – Free art drops from artists in and around Cultivate. Dec 2011: URBAN CURATIONS at Triple X gallery, Netil House, Hackney, London E8. Feb 2010: WALL OF LOVE at Graffik Gallery, Ladbrook Grove, West London.